Lovely tutorial Kerry! I've only tried foundation piecing and am now eager to give the freezer paper a try. I love how accurately you can match up your pieces and the tip on a generous seam allowance is a great one! I really like the use of freezer paper. I can't tell you how many times I have tried another method and ended up wasting SO much fabric because I didn't cut a big enough piece or the angle was wrong or something...so frustrating. This is a great technique! Thank you Kerry! I have only done foundation piecing so far. I am going to try this on my bee block for this month. I have it sketched out but am trying to decide how to divide it up still. I hope I haven't made it too complex for my skill level! What a handsome mug!! I haven't done this type of piecing for ages since I learned how to foundation piece with freezer paper. It's a good reminder that there are more ways to put complicated 'picture blocks' together. Thanks Kerry! Oh goodness, that's a lot of pieces. I shall persevere...I'm still planning to do this...will try to get it done tomorrow morning. I think I will use some scraps I have from the Flurry line from Kate Spain and make a Christmas mug rug. Thanks for all the diagrams - so much easier to "see" how it goes!! Great tutorial. Very easy to understand. Thanks for sharing this technique with us. You know I have a big smile seeing this! I love your mug so much that now I want to use this pattern for my month in the Trad Bee if everyone is consider this traditional. And I want to make this mug rug too!!! Thanks for the tute! Thank you so much for this tutorial. 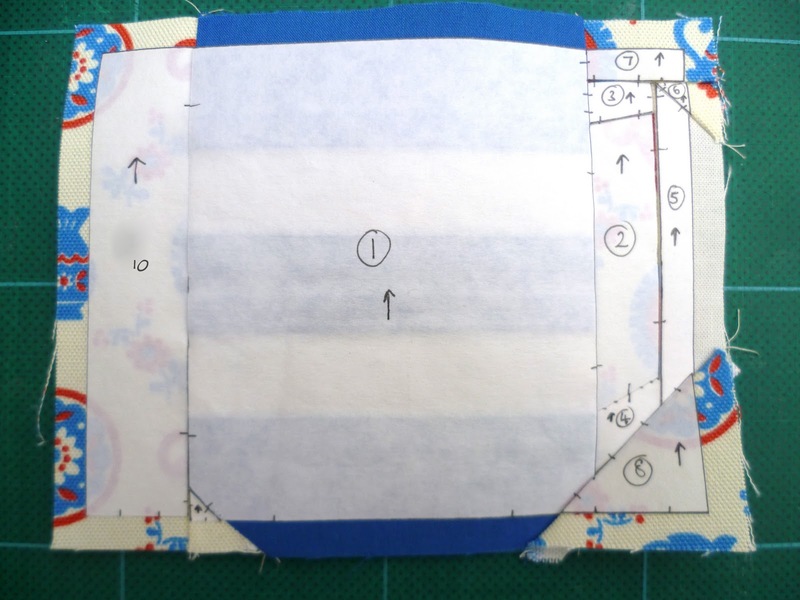 I'd love to try this method of paper piecing and your instructions are so clear and precise. Next time I have to make something like this (and we only have one more month left and I'm not making anything like this for that month so maybe I will never have to ever again...) I will be back here going through this and the next tutorial step by step - they way you've written it makes it sound so easy but I'm still shying away for the time being! I read the shopping list tutorial and I need to gather a few supplies but thanks for such an informative tutorial. Thank you for taking the time to prepare this tutorial. You always make everything look so doable. Very cool mug rug! Thanks for the tutorial! i've done a bunch of regular paper piecing before, but i often get frustrated with lining the fabric up just right. this method seems easier to picture in my head while sewing it. i'll have to try your method the next time i'm paper piecing. thanks for the great tutorial. Pfffft. I was sent here by Ayumi....now I have to become a follower too! Great tutorial(s)! Thank you. This is so awesome about modern rugs. I started to work on one of your free designs and quickly discovered it was not a traditional paper piecing project. After finding this tute (thank you) I discovered what the problem was. Traditional paper piecing uses regular paper or newsprint paper and you are using freezer paper, which makes it a technique called Picture Piecing. Cynthia England uses this method for her designs as well, which luckily I just completed one so was familiar with how it is done. Now to go rip out what I did and start over again using the Picture Piecing technique. Awhile back I purchased a couple of your designs from your Etsy shop. Can you tell me if all of your designs are Picture Piecing or do you also have any Paper Piecing designs? Thank you! I love your designs! Lots of different authors use lots of different terminology- paper piecing seems to cover and refers to several different disciplines. There is also English paper piecing- just to complicate matters! Technically, freezer paper piecing is a template system of piecing which can be used to make a picture or an abstract design with freezer paper acting as the templates. Before starting any pattern-free or bough, I would recommend you read it through first to check construction/materials etc. My Etsy designs are both foundation pieced, sewing through the paper but you could also freezer template them too. I hope that helps!